Most of us have been conditioned by the education system to believe that there’s one solution to a problem, and that your grade (i.e. your success and trajectory) depends on getting it correct. But real life doesn’t work that way - there are often numerous ways to solve a problem, and often there’s more than one answer. The trick here is to first consider what the right problem is that you must solve, and then build your solution. That’s where the Lean Canvas comes in. Want to listen to music on desktop, mobile, car - on the road. Your plan may get you marginally closer to the answer, but the real practice that’s important here is that you build evidence - that you start to capture information that can support your idea. In the startup phase, that’s the only thing that will help lower the risk of the business. And this has to happen in a way where we iterate rapidly. The canvas is a lightweight tool to systematically take the uncertainty and risk out of the business; it enables you to beat the crappiness out of your ideas, and helps you understand the main concepts of your business through iteration. What’s the problem here? What is the lived problem your potential customers' experience? What value do they get from the realization of their aspiration? How are these problems currently solved today? How might the customer describe the unique characteristics of the problem going away for them? What value does a reality without that problem represent for them? A Tip: As you build out the canvas and build your evidence, just know ahead of time that you will revise this canvas repeatedly. Anytime you learn something about an item in one of these boxes, go back and reconsider all three of these boxes. When you move on to the solution, it’s to build a body of evidence that proves that what you wrote in these three boxes represents the reality of your customers. As before, you need to frame your solutions from the point-of-view of the customer. How might your customer segments talk about the solution you intend to offer? This section is about how you get your offer or product to market, about how you activate the customer segments, grab their attention, teach them about your product, and about the mechanisms will you use to do this and get them to get their wallets out. Essentially, what are the inbound and outbound paths to your customers? That which doesn’t turn a profit is a hobby, and that’s not what we’re after here. We want to understand how we change our customers, and we need to know what our costs are in the acquisition and service to these individuals or companies. See “Channels” above to get a sense of where some of your money might be spent (units of measurement) to get attention and convert prospects to paying customers. For example, let’s say we will launch a subscription-based business, and we need to know where and how the money comes in, and likewise how it's going out. We don’t want to get too into the weeds yet, but we have to have a general high-level knowledge of the cash flow and where our customers come from. The items listed in black text are derived values, and those in blue are the inputs into this very simple revenue financial model. What you see in the equation above is a revenue calculation for a subscription business. Simply put, the revenue comes from subscribers paying a monthly fee. 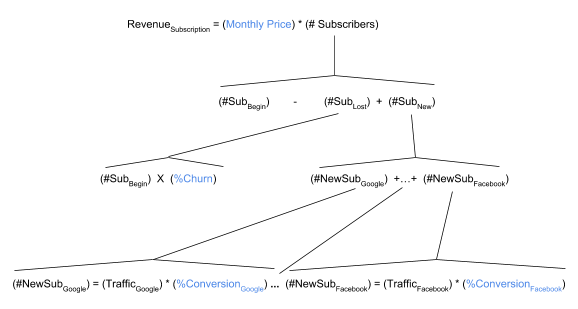 This example model breaks down the subscribers into those who churn out and new subscribers. The new subscriber value further models the various channels where new customers come into the business and breaks down the acquisition of subscribers via Facebook and Google, which breaks down further yet into conversion rates for SEO on Google and Facebook Ad spends necessary to reach your target audience and engage them. This is the revenue equation, there will be a similar equation that accounts for the costs to acquire and serve customers. It will cost us money to make money. Take a few minutes to sketch out your costs and revenue streams. One of the hard truths for almost every startup is that you probably will not turn a profit in your first year. That’s just how this goes, and the most successful businesses in the world had the same experience, so don’t lose heart. What those businesses most likely did, rather than get hung up on profit as a key metric, was to look at some of the leading performance indicators that showed growth. What are the measures that will help you know whether or not you will make money in year one? What do we have that no one can copy? You may not have much at the moment, but think about the experience, talent, background, and education in your team that allows you to address your customer’s problem in a way that no one else can copy. Chances are that all you may be able to list at the moment is your team. Perfect. What makes this team the most uniquely qualified team to address that customers’ need or aspiration? Now that you’ve given some additional thought to the various segments of your canvas, it’s time to put it down on the canvas itself. The order we’ve presented these items to you above is the order in which you should complete the canvas. Important: These boxes cascade, which means that if you change something in the first few boxes, the contents of the boxes that follow will likely also change. When you gain evidence about your business, update these boxes with the understanding that your changes will likely cascade to the other boxes.